3000sf Beautiful Home! Close to Everything Yet Quiet! 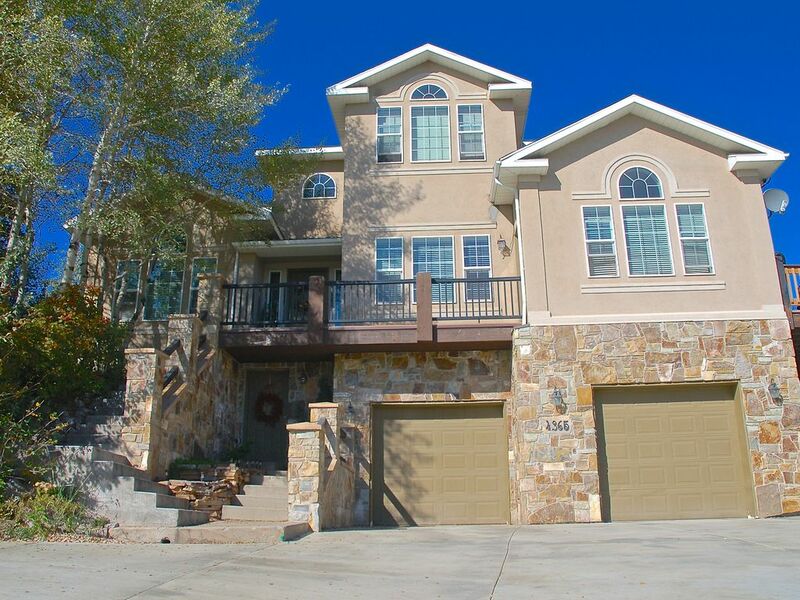 This beautiful 3000 square foot, 5 bedroom, 3 ½ bath home is located in a quiet, residential, mountainside cove with pines and aspens, yet is located about 30 minutes from the Salt Lake International Airport and only minutes from the ski resorts. It’s also only 1 mile from the park-n-ride bus stop with free local transportation accessing all local Ski Resorts and most shopping areas of Park City, giving you the choice to leave your car rather than fight the ski resort traffic and parking lots. The home features a main level Master Suite and a main level Junior Master Suite. The main level has 10 foot ceilings and features an office, entrance ½ bath, family room with gas fireplace and cozy leather couches, and a large kitchen with a dining table seating six and a large island with four suspended barstools. Three additional bedrooms are located on the top floor with a full bath, second vaulted family room with couches, movie projector/screen and a piano, and a large laundry room, that also doubles as a playroom for the kids. The home also features a front entrance deck and a huge 17 ft. by 40 ft. deck, located off the kitchen. The junior master suite has its own private doors to both decks. The home also has many windows to bring in the light and beauty of the outdoors. The home has a two-car garage with lots of room for all your ski/snowboarding equipment. The three bedrooms upstairs share the full bath with granite counters and sink, toilet and tub/shower combo. The largest upstairs bedroom has vaulted ceilings with a beautiful full-wall, hand painted mural. It has a queen bed, desk with chair, closet and dresser/armoire, and a smart DVD player with streaming. The next bedroom has two twin beds, tall and short dressers, closet and small 13 inch DVD only. The third bedroom has a queen bed, dresser, walk-in closet and DVD only. The upstairs family room has vaulted ceilings with rocking/reclining couches in four seats and wall to wall windows to enjoy the outdoor mountain views. It also has a movie projector/screen and DVD/Internet player. The laundry/play room has extra large capacity washer and dryer, and plenty of toys. The Kitchen is well equipped for all your cooking needs and features granite countertops, alder cabinetry, and Australian Cyprus hardwood floors. There are TWO DISHWASHERS, a gas stovetop, built-in microwave, double ovens, and a large side-by-side refrigerator with indoor ice and water. The Main Floor Family Room has two comfortable leather couches, a large entertainment armoire with a 36 inch TV and with DVD player and Roku for streaming. The only television viewing in the home is separate--Roku (via wireless internet) in the main family room, and ROKU TV in the master bedroom. The Junior Master has Apple TV and the Queen bedroom upstairs has streaming via the smart DVD player. The movie projector DVD is a smart dvd with internet connection tv streaming. Any other TV in the home is only used with DVD players and not connected to a 'television' source. There is an office with laser printer that is accessible with your own devices wirelessly. The home's high speed WIFI is available for your use on all your personal devices. A code for access will be given you once you arrive. The two-car garage is large and separated by storage shelves thus making it like two separate, private one-car garages. Since we have three homes on our shared driveway we limit you to only THREE CARS during your stay. Extra cars may be parked 1mi away at the bus stop/park-n-ride during the day, but NO overnight parking. NOTE: The basement level has an additional 1000 sf, private apartment, (not included in the upper 3000sf) which the owners occationally use for personal use, storage and occasional overnight stays. When the owners stay in the apartment, they do park under the deck to the side of the driveway. The home is situated on a long, steep driveway with three homes sharing the driveway. The neighbors and the owners share in the responsibility of clearing the snow as often as is possible, however we do get a lot of snow and 4-wheel drive is highly recommended during the winter—as should be suggested for any place in Park City during the winter. The owners will also come to clear the snow from the decks when needed. The DRIVEWAY IS HEATED, but snow removal is also done via a plow. This home is close to grocery stores, many restaurants, shopping (including the Tanger Factory Outlets), Redstone shopping and movies, exercise facilities, indoor field house, indoor pool at Ecker Hill Middle school and much more. Park City Mountain Resort also has a tubing hill (Gorgoza Park) just 5 minutes from the house. 10 minutes to the Canyons Resort, 15 to Park City and Deer Valley. The Olympic Park is also just a few minutes away—Park City is the place to play! We want to give a great rate, so you can enjoy a wonderful vacation and not worry that you paid too much! And we know you’ll return! Come and stay! We built this beautiful home and stay here when it's not rented. We love it! We keep it clean and updated. The surrounding aspen and pines keep us quiet and secluded, yet we are so close to everything. We know you'll enjoy your stay in our home. Have a happy vacation! If your not staying on the mountain for a ski-in, ski-out vacation-with a price rate to match, this is where you want to be. Our location is 30 minutes from the airport and 10 minutes to skiing. We are just across the freeway from the PCMR Gorgoza Tubing Park. During the summer, we have many hiking/biking trails right beind our home or all over Park City. If you want to boat, we're just 15 mintues from Jordanelle Resevoir. We have all the shopping you could ever want from grocery to boutiques to the Tanger Outlet Mall, all within a 2-5 minute drive. We are also located 1 mile from the free bus stop if that's how you choose to get around; yet we are surrounded by beautiful trees and mountains to offer a mountain retreat vacation. Surrounded by pines and aspens. No central air but does have two window AC units during the summer months. We do provide laundry soap for your convenience. Only 2 cars allowed during winter months, and you must park in the garages. Only 3 cars during summer months and one car allowed behind a garage. We share a driveway with two other homes. Two-car garage for your use with openers. Double door refrigerator with bottom pull out drawer freezer. Double ovens; Built-in countertop Stove. We do supply a cupboard full of spices! Double ovens; double dishwashers; built-in microwave; fully stocked. Dining Table seats 6 and counter top island seats 4 with built-in suspended chairs. In all rooms with TVs. Also available with the movie projector/screen in upstairs family room. We don't provide DVD's but there is a Redbox located 1.5 miles away. Retro gaming system available with games in upstairs double twin room. Jordanelle Reservoir is a State park about 15 minutes away. Camping and boating. (2) Large 40 foot by 17 foot side deck and smaller front deck. Deck has small table with four chairs and other chairs for lounging during summer months. 10 minutes from The Canyons Ski Resort. 15 minutes from Park City Mountain Resort and Deer Valley Resort. The Ecker Hill Middle School (across the freeway) has an indoor public lap pool, hot tub, and kiddie pool. We also have a full digital Yamaha Piano. Upstairs family room with movie projector/screen and dvd player. Heated Driveway and additional snow removal via plow. Great house. Our family comes out west to ski every year and this was one of our favorites. Everything worked as advertised and was modern and the house overall was very comfortable and homey. For a large group of 9 of skiers it’s difficult to find a suitable home at a great value. Katie’s home was perfect. It was fully equipped, clean and had many extras. The kitchen was spacious and had everything we needed for breakfast and dinner every day. Two dish washers was a great choice by the owners. We enjoyed the home movie theatre (great feature) and many other group seating options. The driveway is very steep, and we took the advice of securing 4 wheel drive vehicles. They mention this in their listing and it’s something you should definitely consider. We met Katie and Wade a few times during our stay, and they were very friendly. Overall, it was a a great home that made everyone feel comfortable...not to mention the views! When we make our way back to Park City we would definitely love to stay here again. Comfortable, clean and quiet. The perfect experience. The house more than lived up to expectations as did the owners! They were gracious and attentive ! We are a group of skiers who have been coming to Utah for 35 years! This was the first time we had rented from Katie and Wade but they were super to work with and were right there keeping the driveway clear! The house is away from the crowds but very accessible! The big screen TV was great to watch the Super Bowl and movies! Highly recommend!! Thank you Katie and Wade! and accommodating. Can’t say enough about the spectacular beauty of Utah, the awesome skiing in the Park City area, and the convenience of staying 1/2 hour from SLC airport and minutes from the slopes. Looking forward to visiting again! We (my husband and I along with our 3 kids and my in-laws) picked this area to stay because of being fairly central to the ski resorts. The house was beautiful and very clean with room for everyone to spread out. It was fully stocked with everything we needed and when I contacted Katie to see if they had certain items both times they had it for us to use. You definitely need 4-wheel drive in the winter but we were told before hand so we were fine. The kids loved all of the games there for them to play with. We would definitely stay here again and we recommend this house to others. Thanks Lisa! Your family took beautiful care of our home during your stay and you are certainly welcome anytime!! Thanks for encouraging others about the need for 4-wheel drive--we just can't emphasize that enough. We don't want anyone to be surprised and so we list it on the website, and remind in our "Welcome Letter." We are so glad you had a great time!!! It was well worth the ten minute drive to canyons or the 15 minute drive to park city base to have the luxury, spaciousness, and spectacular view. We hope to come back next year. So many activities available in Park City. Available during all seasons. Come and Play!!! The refundable damage deposit will be returned to renter within two weeks of departure pending any damages or non-compliance with the rental agreement.